Home Featured Politics HON. TOLA BANJO: The ‘’IJEBU ODE’’ Son Whose Track Record Of Quality Representation Stands In The-Gap For, As He Seeks A Second Chance To Bring Back More Dividends Of Democracy For His People. HON. 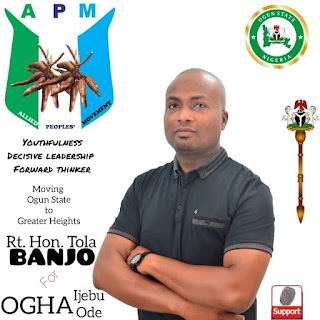 TOLA BANJO: The ‘’IJEBU ODE’’ Son Whose Track Record Of Quality Representation Stands In The-Gap For, As He Seeks A Second Chance To Bring Back More Dividends Of Democracy For His People. Hon. Tola Banjo is not your usual politician who remembers his constituents only during election periods, but one who is seen and related with as often as possible, creating atmospheres of cohesion, between he and those he represents in other to give them senses of constant belonging on how they are represented and kept abreast of developments across the state. 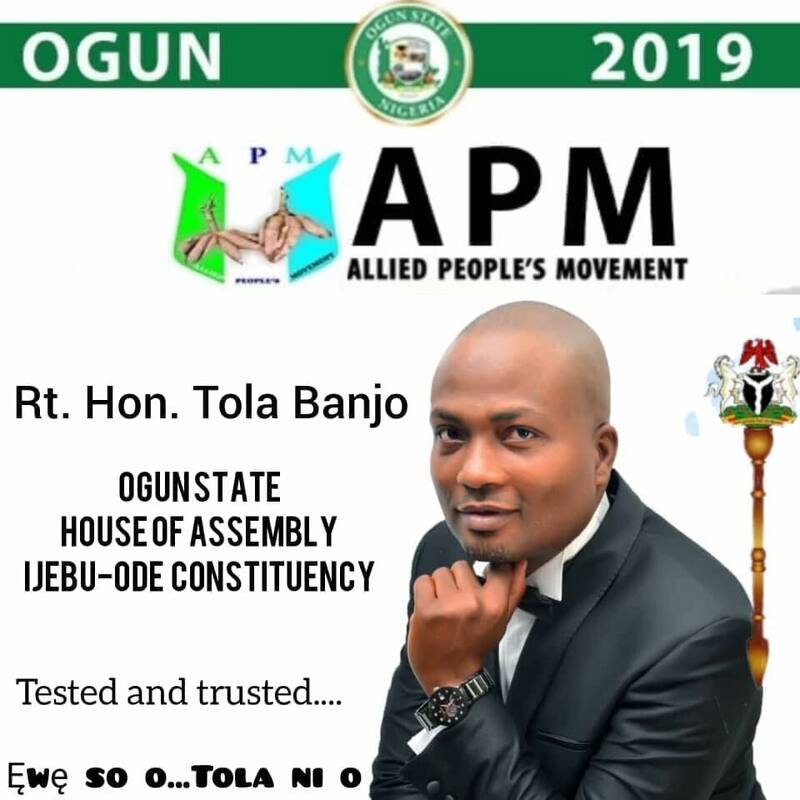 He is a man whom according to research, keeps to his words and this is why the people of Ijebu Ode State constituency are clamoring for his return into the Ogun State House of Assembly for continued quality representation which has in the past, brought to them, dividends which is achievable by a man whose word is his bond in the state. Speaking to Precious Eze’s Blog during the flag off of his campaigns, all the people spoken to attested to the fact that it is the people who want Tola Banjo back and he couldn’t resist, as he had in the past, redeemed all his promises to his people, and like they say, ‘’when the right hand washes the left hand, the left hand will wash the right hand, and they two will be clean’’, so, we, the constituents of Ijebu Ode are now trying to wash Tola’s right hands as he had done to our left hands in the past through empowerment projects he had attracted to us, so we’ll continue to enjoy him throughout his stay in the House. He is a good man, another constituent says, who has done us well in the past and we’ll not forget that in a hurry and so, the crowd you see here today, going round to convass for votes for him is a testament of the fact that he is a good man. Look at it, you can only get this kind of crowd as either a House of Representatives or Senatorial Candidate, but a House of Assembly candidate....., this is a wonder. As the candidate of the Allied Peoples Mandate, APM in the forthcoming election, Tola Banjo says his desire is to touch every family in the Ijebu Ode State constituency through the sponsorship of bills that will see to it that all lives are made meaningful to his people and then, help, as a legislature, attract projects and programs that will have direct impact on the people. My people, Tola continued, know that I don’t make promises I have no intentions of keeping, which is why they are trusting me again with their mandate for another four years in the House of Assembly and like I did before, I will neither fail nor disappoint them God helping me, because, I will operate an open-door policy that will allow my people have access to me as regular as possible, so they’ll continuously feel a sense of belonging here. I would therefore use this medium to plead with my people to trust me again by voting for me and other candidates on the platform of the Allied Peoples Movement, APM, especially the governorship candidate, Hon. Adekunle Akinlade and together, we will bring the desired change we have all been seeking, Hon. Tola Banjo ended.